Bay View Villa is only recently completed to a very high standard. The villa has 3 double bedrooms all with an en-suite bathroom. All of the bedrooms also have a fantastic sea view. 2 of the bedrooms also have a private balcony. The living area is open plan with seating for 6 people. The villa is fully air conditioned. 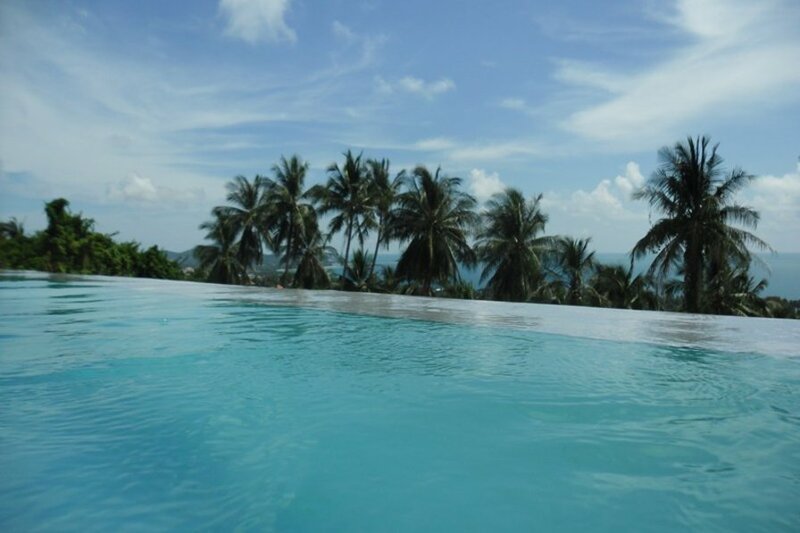 Bay View Villa also has an amazing 10 meter swimming pool with infinity edge and colour changing lights that change the colour of all the pool so night time swimming takes on a new dimension! The Villa is situated 1.6 kms from the main ring road. It only takes 5 minutes in a car or bike to get to the nearest beaches, although you could walk it in 20 minutes. Chaweng is the main area in Koh Samui where you will find a very impressive array of restaurants, shops, bars and entertainment. Bay View Villa is situated in a very quiet jungle location with another 5 houses. At night the villa comes into its own the an amazing view of Chaweng and the lights from fishing boats lighting up the sea. A stay at Bay View Villa would be the highlight of any holiday.